Entry to the World Crazy Golf Championships is open. Taking place at Hastings Adventure Golf on June 9 and 10 the competition is open to anyone and any ability. The global competition has two categories - one for novices that is played on Saturday 9, June and one for professionals played over the two days (Saturday 9 and Sunday 10 June). Each category competes for a separate prize fund too. �3,000 prize fund is allocated to the professional category, with the overall winner scooping �1,000 - the largest prize fund in mini golf. A separate prize fund of �1,500 is allocated to the novice* category. Competitors must beat the windmill and watermill as well as negotiate the bends, twists and ramps on the traditional seaside course at Hastings Adventure Golf � dubbed the UK's 'spiritual home of mini golf'. For the first time ever the organisers are also awarding prizes for 'best dressed', 'personality of the weekend' and 'most improved player'. Seasoned pro and twice runner-up, Sean Homer, said: "I made my debut in 2006 and got hooked on the game. I've played in every competition since. It's fantastic that the Hastings' event is still focused on what has always made it so special - a fun, exciting, inclusive and entertaining spectacle for the young, old and everyone in between." 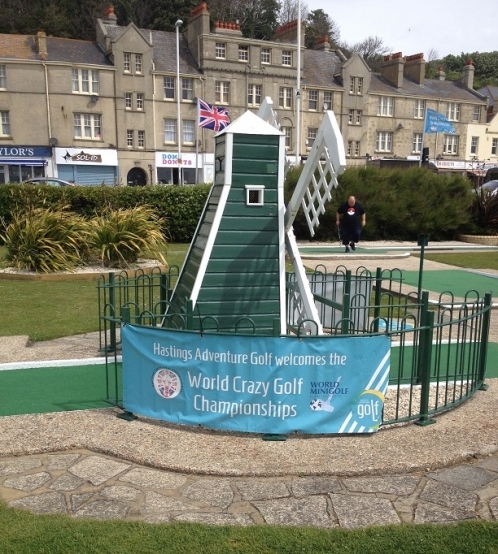 This is the sixteenth year that Hastings Adventure Golf has hosted the global championships - now firmly considered the pinnacle competition for crazy golfers in the UK and beyond. Simon Tompkins of Hastings Adventure Golf said: "We want players of all abilities to get involved. The novice category is open to anyone who fancies their chances at taking home the prize fund. So get the putters polished and start practicing!" Enter via the Hastings Adventure Golf website: www.hastingsadventuregolf.com. All entrants are entitled to half price practice golf at the complex.